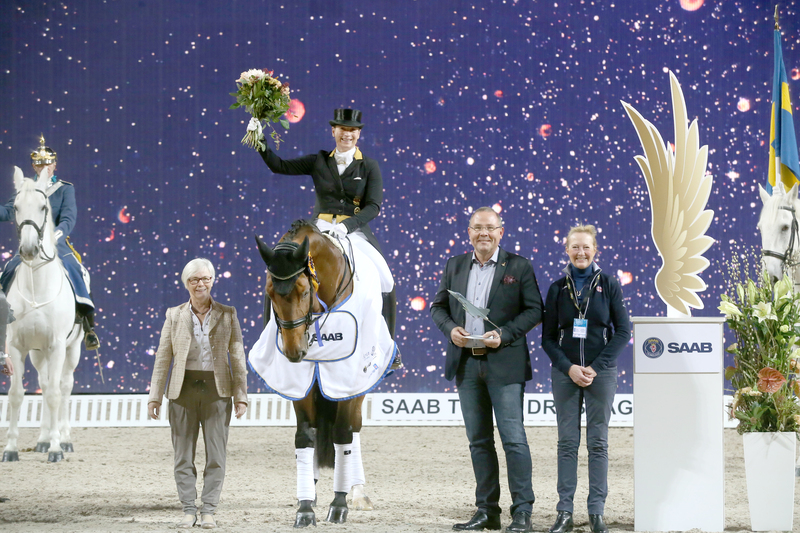 Saab Top 10 Dressage is a new exclusive competition for the best dressage riders in the world and today saw the first part of the final at Sweden International Horse Show in Stockholm. The best riders in the world are invited to Saab Top 10 Dressage: The top 8 riders as of FEI World Ranking 30th of September, of which 1 has to be best ranked Swedish regardless of his/her place, and two Wild Cards. Mastermind behind the concept is Swedish rider Patrik Kittel. The strong starting field of today’s competition included Isabell Werth and Helen Langehanenberg (GER), Cathrine Dufour and Anna Zibrandtsen (DEN), Inessa Merkulova (RUS), Severo Jurado Lopez (ESP) and not less than four Swedish riders on home soil – Rose Mathisen, Tinne Vilhelmson Silfvén, Patrik Kittel and Therese Nilshagen. Winner of today’s Grand Prix was Isabell Werth and her 11-year-old gelding Emilio 107 with 79,700%. Catherine Dufour and Atterupgaards Cassidy were close on second place and 79,300%. – It’s always good to come to Sweden, the Swedes have an emotion for the equestrian sport, and the atmosphere in the arena is superb! Over all the conditions are perfect here at Sweden International Horse Show, from the stable to the amazing arena with the huge screen. The warm up was a little bit too long for Emilio and me; I couldn’t really keep up his energy. But I am really happy with him as he is not so experienced. This will be a great fight tomorrow between Catherine, and me, says Isabell Werth after the competition. – Emilio is a special horse, as a youngster no one had a good solution for him. He has improved a lot in the body the last 10-15 months, I can be really happy with him. Today he was on, but focused, he has no problems with the atmosphere and is not spooky at all, and that’s good, Isabell continues. Isabell had some small mistakes in both the transition between the collected walk and passage, and also in the flying change. Second placed Catherine Dufour was happy being back at Sweden International Horse Show. – This show is amazing! The stable is so silent and the arena is fantastic. It doesn’t matter that this is not my home crowd; the audience is with us anyway. – It’s fantastic with this competition – it’s really racing the standards for all other organizers. When I got the question from Patrik (Kittel) to participate, I was just all in! This is a top show and I wouldn’t want to miss it. Third place on home soil went to Therese Nilshagen and lovely 10-year-old stallion Dante Weltino OLD. – It was a nice feeling to ride for the home crowd here in Stockholm, my first time! This was the first big indoor competition for Dante, and I was not sure how he was going to handle the atmosphere, says Therese Nilshagen and continues: Tomorrow I will try my best, be focused and do as good as possible. Therese and Dante had an amazing start with 9-10 on the extended trot and ended up at 77,980%, a personal best for the two. Isabell Werth praised Saab for making the Top 10 final possible. – We were dreaming about this for a long time, and I’m really happy and thankful to Saab that we get the support to make this show possible. It is the duty of all of us to come here and give something back and to show this great sport. Saab Top 10 Dressage continues tomorrow Sunday with the Grand Prix kür.